The Pack AD will be heading to New York to play at the CMJ 2009 Music Marathon and Film Festival. They were selected to play at CMJ 2009 by applying via their Sonicbids account. A long time ago, I used to work in the same bookstore as Maya. Please identify yourself(ves) for those reading, what you do in the band and who else plays in the band. This is Maya Miller - drummer, organizer, and exactly one half of The Pack A.D. Becky Black plays guitar and sings and is exactly the other half of The Pack A.D. When did The Pack A.D form and how did you come together? We were in another band with a couple other friends that didn't work out but from it we discovered that we played really well together so we kept it up, just the two of us. What do you find so inspiring about the blues? They're a perfect marker as to what to steer away from. Ha, apologies, you've really caught us at a time of change musically. We both love the blues but we never set out to be blues players and in point of fact, we're not. We rock out and incidentally, all rock comes from the blues. In Vancouver: Thee Manipulators and Canaries. Do you ever miss not having a bass player? We've never had a bass player in The Pack. We never will. Can't miss something you've never wanted. what makes this festival worth crossing the country for or is it just another show? It's always worth it to play New York and what better way then CMJ. Campus Stations are crucial to newer bands. Are there any bands that you want to see while you're there? What's your favourite song from the 80's? I believe Becky's current fave is Puttin' on the Ritz by Taco. For me, err, Paint a Rumour by The Eurythmics. But to be honest, neither of us listen to stuff from the 80's...should we be? Are we missing a trend? Gasp. Recently, a pair of boxers with the map to London's tube lines on them. Hard to come up with the coolest thing ever, most things are really cool at first and then to be honest I lose track of them. Thanks for doing the interview, you have the last word, say what you want to say. Come to ours shows at CMJ and bring all your drunk friends and tell everybody because that's they way it should go down. People digging a band and sharing it. Immaculate Machine will be heading to New York to play at the CMJ 2009 Music Marathon and Film Festival. 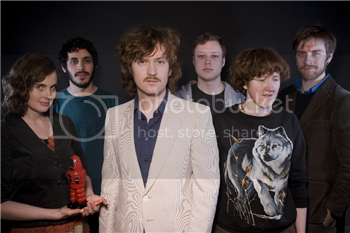 They were selected to play at CMJ 2009 by applying via their Sonicbids account. I'm not sure if Brooke got my High on Jackson Hill joke or not. We are a rock band from the West coast. The musicians change but right now we are on tour in Europe with a great lineup: Aden Collinge on drums, Brooke Wilken on guitar and background vocals, Caitlin Gallupe (my sister) on bass and vocals, Leslie Rewega on keys and Brooke Gallupe (that is me) on lead vocals and guitar. We are in a hotel in Hamburg right now and I am writing from my iPod so pardon any bad spelling. When did Immaculate Machine form and how did you come together? Immaculate Machine started after high school, with three friends who couldn't find a bass player so made do with a trio. We signed with Vancouver's Mint Records in 2005 and released Ones and Zeros, our first album in a proper studio. Then we did a proper tour, with proper promo in proper venues. It was all very exciting, but it has taken me a while - 4 years I guess - to understand that recording at home and doing certain things a little more casually can have its advantages as well. As a band from Victoria, being so close to Vancouver, have you ever thought about moving to Vancouver? What keeps you based out of Victoria? Victoria is a constant source of inspiration for me. Vancouver has a lot more going on, obviously, but in some ways all the action of a big city can stifle its personality. I love living right downtown in the of a small city, somewhere you can be in the social centre. For music business reasons, we should probably leave Victoria, but there is more to music than selling albums. Victoria is very isolated. If we were in the music centre of Canada I am sure we would have done dozens of collaborations with K-os and Sam Roberts and all the movers and shakers and all kinds of big things, but... We tried moving to Toronto one year, but we never did any practicing or songwriting because we were too busy being drunk bohemians. It's embarrassing but I have been out of touch with local music ever since we started touring regularly. I swore it would never happen, but hard as I try to get to shows and keep up, it's not easy when you are not playing locally all that often. There are a few great bands, like The Racoons (sic). I'm sure you're tired of this question, but any update on Kathryn? Kathryn has been taking a break from music this year due to some personal things. I think she will be doing some stuff with her other band next year and we have been talking about what we want to do with the next Immaculate Machine album. But there is nothing firm yet, just ideas. You'll be traveling to New York to play at CMJ near the end of October, what makes this festival worth crossing the country for or is it just another show? We will be crossing the Atlantic for this show! We are finishing a European tour in London and flying to New York just in time for CMJ. We have played it before and the atmosphere is amazing. Some of these industry festival are pure havoc when they take over a town but New York absorbs it so seamlessly that you are just like, yup, New York has a zillion things to do all within easy walking distance, why do i not live here? Last time we played cmj, elijah wood stood in line to see us but since it was sold out he never got in. So it was a no-brainer to submit our sonicbids EPK application this year. I haven't had a chance to look, but I am really looking forward to seeing who is there. I hope the Dodos are, I have been meaning to try to see them. The new record High on Jackson Hill was recorded in Brooke's parent's house in order to get a more "natural" feel. Was there any point during the recording process where the unconventional environment hindered the process? The sound is a little rougher of course, but if you are not a hi-fi sound snob, I don't think that is too big a deal. Overall the album is much better. Do you think you'll be seeing more people smoking on Jackson St? Jackson Street is a small residential road on a great big hill overlooking the whole city, which is difficult when you are cycling there every day, but a great place to hang out. I have no idea what you could possibly be talking about with regards to smoking. In the song "Only love you for your car," what car is referenced and whose was it? It references my teenage years, when a car parked in a dark corner was the only privacy you could really find. There's a song on the new album called "He's a Biter", what's that about? My sister does all the artwork for Immaculate Machine and always has. She has a fairly distinct style and one day I saw what seemed to be a direct rip-off in a restaurant in Victoria. When I mentioned that this artist was biting her style, she just shrugged and said, I guess that means it's time to move on. Great attitude, little sis. What new albums have you been listening to? Dirty Projectors, Blitzen Trapper, Sleepy Sun... but mostly just a TON of Thin Lizzy. Wow that is a lot to choose from. I guess something from Jonathan Richman and the Modern Lovers. Last week we were in Prague at the Kolbenova flea market, which is a massive massive garage sale in a dusty parking lot where you can buy anything. Anything at all, from coffins to soy milk to rifles all at the same place. Vendors pull up their cars and lay their wares out on a dusty blanket and you go and try to gesture the numbers since no one speaks any English. I bought a postcard stamped by the Nazi authorities when Czech was still occupied. I haven't been to the Biltmore in a while, so it sort of surprised me how tiny the place actually is. It's one of those places that are pretty nice on the inside with quite the cozy atmosphere, however with a low stage, it's not really that great if it's packed and you want to see anything below the performer's head. Mono came out while classical music was being piped out of the PA system, which was kind of interesting. I snuck a look at the setlist during change over and noticed that there weren't any songs before the last two albums. Not that this should surprise me, because even in their last tour, they mainly stuck to recent material. It was a little disappointing that I wouldn't be hearing tunes that I"ve become used to hearing at a Mono concert like "Halycon" or "Lost Snow". If it's any consolation however, their recent stuff does contain songs with the same elements that made the aforementioned songs awesome (crescendos/airplane take offs, chimey melodic songs). Their drummer has a gong as part of his live setup. I never actually saw him use it, though my friend says he saw him hit it during their first song "Ashes in the Snow". If you were near the front row you would have seen Taka at one point in the show on his hands and knees looking like he was overcome with emotions or in a musical trance. At the beginning of Everlasting light there was a pretty cool glockenspiel duet with Taka and the drummer, on two different sets of glocks. There was no encore, just 90 min of emotion rich instrumental musical energy.